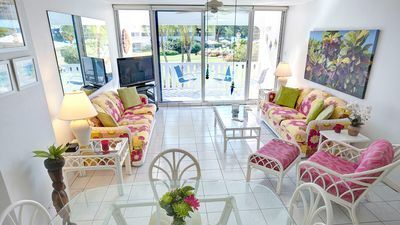 Kiwi Kai is perfect for the couple or family that enjoys tropical open air living. 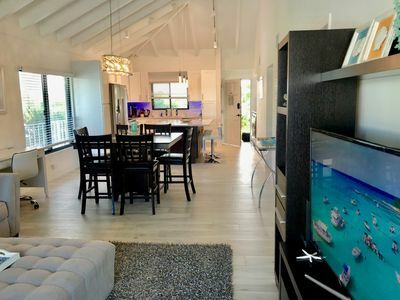 This 910 square foot unit is right on the beach at Cayman Kai, Rum Point, North Side, on the island of Grand Cayman (one of the closest units at the Sea Lodges to the beach). 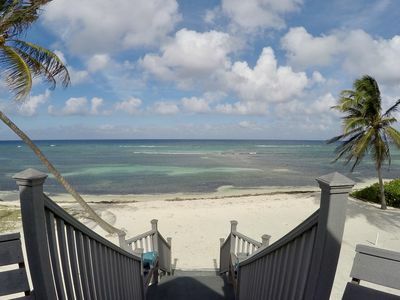 You will be a few steps from snorkeling, swimming or wading in the beautiful Caribbean Sea. 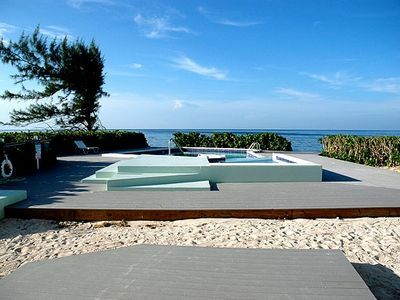 Soak up the sun on your nearly private beach where you can listen to the gentle sounds of lapping waves. 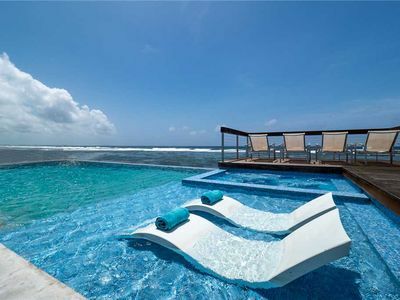 The ocean area at the Sea Lodges is designated a protected marine park, so the fish and the reef are amazing. 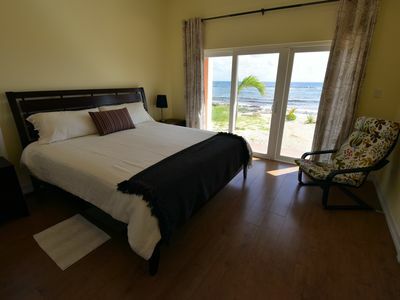 All rooms have Caribbean views and open to screened porches. 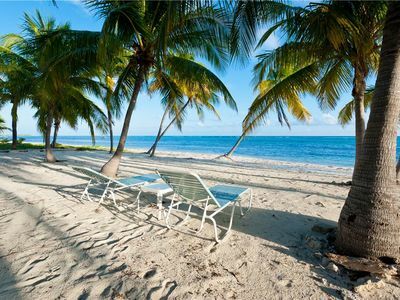 Chaise lounges and thatched beach cabanas are available for your use. We also supply a charcoal grill. Ceilings are vaulted to 16 feet with Casablanca fans throughout. 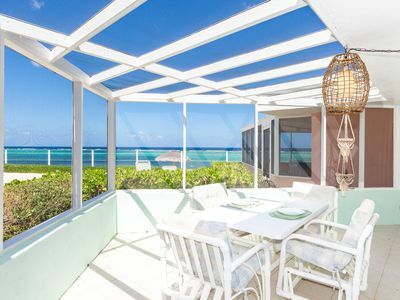 Kiwi Kai uses louvered doors and windows for cross-ventilation cooling, permitting you to listen to the amazing sound of the wind in the palm trees and the soothing waves of the sea. 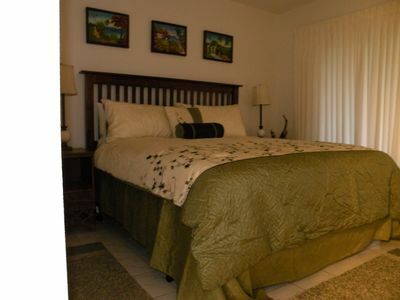 We also have air conditioning in the bedroom and kitchen/living area (two units). The kitchen is equipped for your cooking needs. There is a washer/dryer in the unit available for your use. The comfortable living room includes a few books and games. 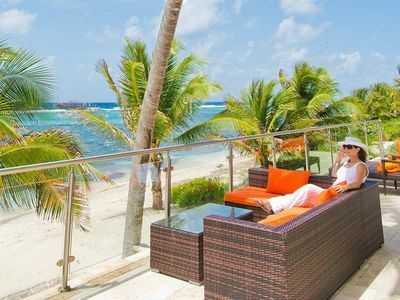 This is definitely a retreat from a busy world and a get-away from the touristy spots elsewhere on the island. We do, however, supply a smart TV with Netflix connectivity (no regular/cable tv) and a modem for Ethernet and wireless internet access. We renovated our bathroom in 2018, so the bathroom is now completed tiled and has a walk-in shower! 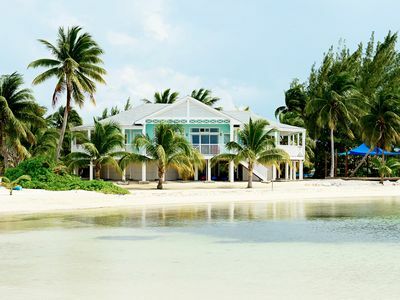 Kiwi Kai is licensed by the Cayman Islands Department of Tourism, meeting strict standards of safety and cleanliness (notwithstanding ownership changes, Kiwi Kai has been continuously licensed since the 1990s!). 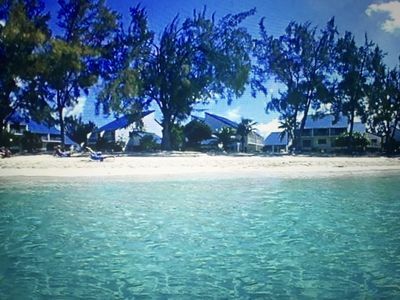 For more action, head over to Rum Point - a short walk or drive away, where you can pick up excursions (Stingray Sandbar, snorkeling, glass bottom boat tour, etc.) 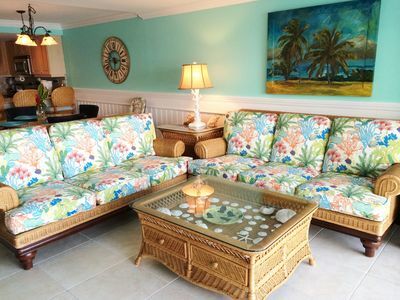 and rent snorkeling, safety, and water sports equipment. You can also find a bite to eat there at the Wreck Bar (casual lunch on the beach) and at Rum Point Club (nice dinner at Rum Point). 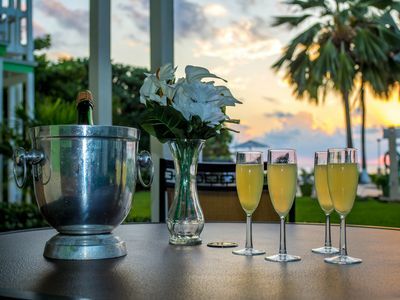 Kaibo Beach Bar and Grill (casual lunch and dinner on the beach), Kaibo Upstairs (special occasion dinners), and Starfish Point are just a few minutes away. The bioluminescent bay is also nearby, and there are a few operators that offer night-time kayak tours, with availability depending on the lunar cycle. You can also check out the Queen Elizabeth II Royal Botanic Park (~20 minutes from Kiwi Kai), the Blue Iguana Recovery Programme (tours available at the Botanic Park), and the Mastic Trail (~20 minutes from Kiwi Kai). I have another unit at Rum Point that is just a couple of minutes away. 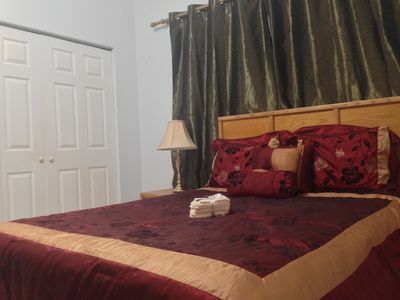 https://www.vrbo.com/597191. When we travel with family or friends, we often stay at one property, and our friends / family stay at the other. Very convenient but still provides privacy! Great for two couples of two small families traveling together! 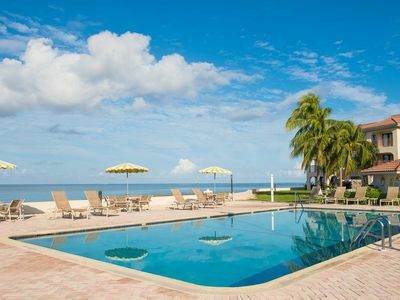 Start Your Private Getaway At The Best Location In Rum Point. 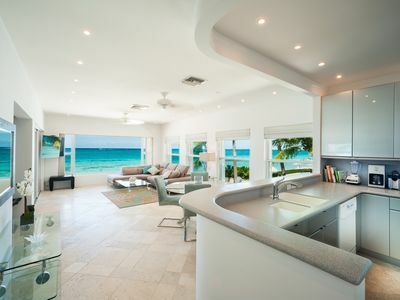 Luxury Beachfront Condo with GORGEOUS views! Seven Mile Beach! 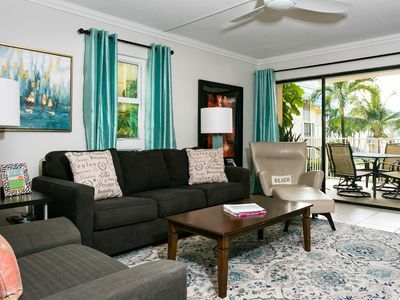 Prime location on Seven Mile Beach at Grapetree Condos "Polly's Place"
Gorgeous 2BR/2BA On Private Resort Beach! Fully Renovated from Top to Bottom! 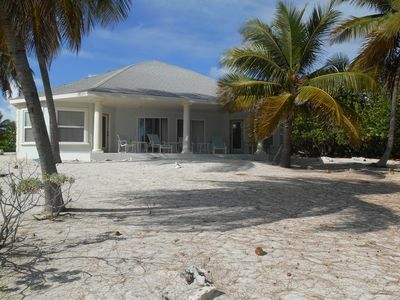 Beautiful private 2 acre sandy beach on the Caribbean Sea.